Published in Newsday by Jeremy Olshan. John Norwood does not believe in waste. When a glass falls off the kitchen counter and the shards cascade across the floor, he heads for the workbench, not the wastebasket. The College Point artist and former model maker for architect I.M. Pei paints the pieces and glues them back together. He incorporates the results into one of his dioramic boxes. The largest of these boxes might be Norwood’s unusual home. Built in 1919, the house originally was a stable. Boats would drop off shipments of coal at the adjacent marina, which would then be delivered across College Point by horse and wagon. Norwood and his wife purchased the 3/4-acre property in 1996, and he spent the next year working on the $200,000 renovation before they could move in. The Norwoods lease the marina to somebody else, and they do not own a boat themselves. “I’m dumb enough to own a marina, but not dumb enough to own a boat,” he said. From the outside, the house looks like a big, white box that blends in with the bottling plants and other industrial buildings along the waterfront on 119th street. The address is painted in giant blue numerals, further adding to the impression that the structure is more sweatshop than sweet home. “What it looks like from the street isn’t terribly important to me,” Norwood said. He prefers to think inside the box. Norwood, 66, connected the stable to a neighboring building with a Plexiglas walkway and skylights, and on the second floor added two rooms out toward the marina. These accentuate the home’s panoramic waterfront view of LaGuardia Airport and the Manhattan skyline. With the exception of the kitchen, which is almost entirely an Ikea production, the rest of the interior decoration maintains Norwood’s waste-not philosophy. “I never throw anything out, and it drives my wife crazy,” he said. Boat ladders he scavenged from the marina are used as bathroom shelves and towel racks. A ship’s porthole marks the doorway to one of his daughter’s bedrooms. Nearly every other inch of wall and floor space is filled with Norwood’s work: From paintings he did at the Chicago Art Institute more than 40 years ago to one of his more recent orange boxes, drafted for use as a coffee table. Norwood has made sculptures entirely out of his own cigarette butts, and one day hopes to build a pyramid entirely out of 10 years’ worth of Marlboro packs. One of his many boxes is made from leftover pieces from Pei’s pyramids at the Louvre in Paris, for which Norwood did the models. Another from the skeleton of a sea turtle. Another from Styrofoam boxes used to deliver medical supplies to his wife’s nearby pediatric practice. The paintings, boxes and sculptures that do not fit in the house adorn the walls of his wife’s practice. The rest is stored in a warehouse. Before retiring 17 years ago, Norwood produced models and renderings for many of Pei’s best-known projects, such as the Jacob Javits Convention Center. When the Panorama of New York at the Queens Museum was updated in the early 1990s, Norwood produced the model of the convention center. Norwood was born in North Carolina, raised in Virginia, and spent his formative years in Chicago and in Europe. But he and his wife, Dr. Ruby Malva, have lived in Queens for three decades. The downstairs of the house is almost entirely Norwood’s domain. Hundreds of variations on sliced columns and model cities he’s made fill the tables of one room. 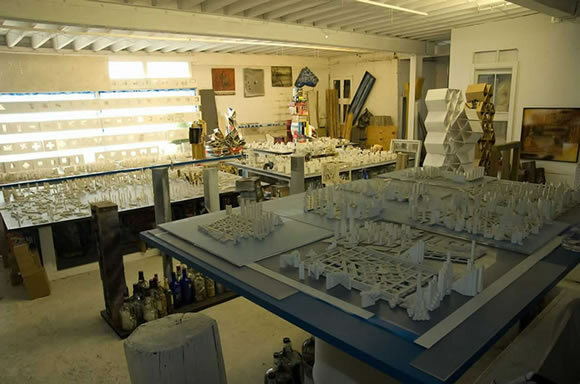 His workshop, which is not heated, is filled with other ongoing works in progress, some begun decades ago. Norwood’s work has been shown in galleries and other exhibitions, most recently at the Queens Museum of Art in Flushing Meadows. As much as Norwood is compulsive about saving and meticulously cataloging every last scrap, he says he would prefer to sell it all so that he could start anew. But his greatest fear and frustration is that his work is ultimately destined for the garbage dump and not the gallery.